I developed my passion for women's health while in the Peace Corps in Ecuador, where I lived and worked for two-and-a-half years in the rural health education program.My philosophy is: the patient is the boss, and her care and satisfaction are my number one priorities. I am originally from Fort Worth, Texas and completed my high school education at the Texas Academy of Math and Science (TAMS) at the University of North Texas. After TAMS, I graduated from the University of Texas at Austin with a Bachelors of Arts. I, then obtained my medical degree from the University of Texas Health Science Center at San Antonio with honors as a member of Alpha Omega Alpha. I completed my residency in Obstetrics and Gynecology at the Johns Hopkins Hospital in Baltimore, MD. Prior to joining the Women's Specialists of Houston, I completed a fellowship in Minimally Invasive Gynecologic Surgery at The Methodist Hospital in which I focused on laparoscopic and robotic surgical procedures. I am fluent in Spanish and am able to accommodate the needs of Spanish-speaking patients. My outside interests include spending time with my husband and family, traveling, nutrition and fitness. 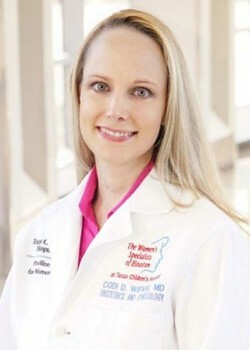 Dr. Wiener is Board certified by the American Board of Obstetrics and Gynecology in Obstetrics & Gynecology.